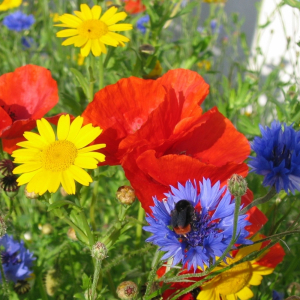 This mixture is ideal to sow in the spring and will give vibrant colours in the summer of the same year. Contains five species that would traditionally be found in disturbed cultivated fields before commercial use of weedkillers. Contains: Corn Chamomile, Corncockle, Cornflower, Corn Marigold, Field Poppy. Remember that at GrassSeeds.com, all grass seed varieties in our mixtures are trialled and recommended by the Sports Turf Research Institute. We do not sell poor quality or untested grass seed...buy with confidence from licensed seed merchants, registered with the Department for the Environment, Food and Rural Affairs.